US President Donald Trump has offered a plan to break the "logjam" in Congress over the US-Mexico border wall, including legislative relief for "Dreamer" migrants and offering $US800 million ($1.11 billion) in urgent humanitarian assistance. Dreamers — the children of illegal migrants brought into the United States — will be given a three-year extension to legislative protections allowing them access to work permits, social security numbers and protection from deportation. The extension would affect some 700,000 Deferred Action for Childhood Arrivals (DACA) recipients. Mr Trump also proposed a three-year extension of the temporary protected status (TPS) for the 300,000 immigrants whose protected status is facing expiration, as well as the capacity for Central American minors to apply for asylum from their own countries. What drives Tatyana, 21, heavily pregnant and with two tiny kids in tow, or 13-year-old Daniel, to make an epic trek over thousands of kilometres? Eric Campbell tells the stories of the people behind Donald Trump's wall. So far so good.... These people are desperate. They deserve a break... Their own countries are violent and not "good" for families. A) WHY are their countries so bad? B) WHY is it only under Trump that there are now "caravans" of refugees being staged? Answer: Trump did not "create" the bad situation in Central America yet (he has not had time, has he?). This situation has been lingering for years. Trump was elected on a promise of extending the wall between the US and Mexico border (which Obama extended without fuss from the liberal press). So what is the fuss about? Nothing to do with the wretched people who are being played like pawns. It has all to do with the Democrats not having won the presidential gig. The Mexico–United States barrier (Spanish: barrera México–Estados Unidos) is a series of vertical barriers along the Mexico–United States border aimed at preventing illegal crossings from Mexico into the United States. The barrier is not one contiguous structure, but a discontinuous series of physical obstructions variously classified as "fences" or "walls". Between the physical barriers, security is provided by a "virtual fence" of sensors, cameras, and other surveillance equipment used to dispatch United States Border Patrol agents to suspected migrant crossings. As of January 2009, U.S. Customs and Border Protection reported that it had more than 580 miles (930 km) of barriers in place. The total length of the continental border is 1,954 miles (3,145 km). The barriers were built from 1994 as part of three larger "operations" to taper transportation of illegal drugs manufactured in Latin America and immigration: Operation Gatekeeper in California, Operation Hold-the-Line in Texas, and Operation Safeguard in Arizona. The two women say Border Patrol agents and local experts have actually demanded the border wall be built for years, and US President Donald Trump is answering their demands. Two women married to US Border Patrol Agents have sent an open letter to US Speaker of the House of Representatives Nancy Pelosi, inviting her to come visit Texas and see first-hand why a border wall between the US and Mexico is urgently needed. "We the wives of the Rio Grande Valley Border Patrol would like to cordially invite you to come visit McAllen, Texas, as President Trump did. We would like to show you around!" the letter, published on Facebook, reads. "You don't need to bring any security detail. Our husbands/significant others are actually very good at their jobs, thank goodness!" it continues. "We'd also appreciate if you'd stop pretending you care about federal workers. If you did, you would care for their safety, not just their paychecks. We can hold out awhile longer, if it means our husbands and communities are safer." The two women were invited to "Fox & Friends" Monday, where they extended their invitation to all lawmakers who oppose Trump's demand for border wall funding. 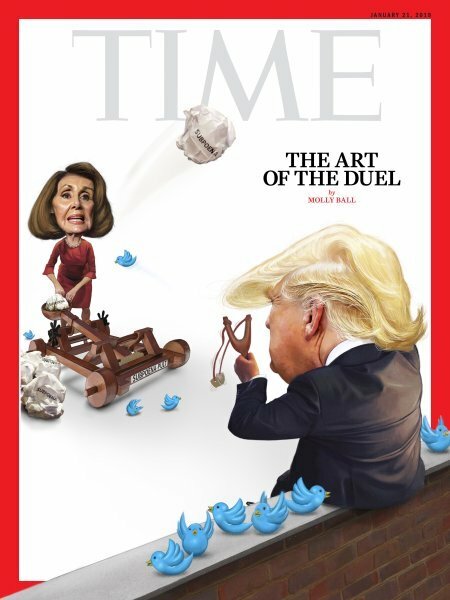 Pelosi is leading the wall opposition force in the Congress. "I just felt it was really important that our leaders come here and see what's happening first-hand," Jill Demanski, one of the two wives, explained to "Fox & Friends." "It's important for them to meet with the people that are here on a daily basis, that are witnessing it and the effect that it has on our country. We want them to come here and make an informed decision." Since the mid-term elections on 6 November 2018, President Trump has been under extreme pressure. Federal administrations have been closed since 22 December (the shutdown), because of parliamentary opposition to a budget proposition which included the financing for a Wall at the Mexican frontier. The crisis only came to an end 35 days later, on 25 January 2019, when President Trump provisionally bowed to the demands of the Democratic Party. According to S&P Global Ratings, the shutdown will have cost more than 6 billion dollars, which is more expensive than the Wall it was supposed to economise . During this period, the Trump administration multiplied signs that it was renouncing its foreign and Defense policies, and rallying with US imperialism. Taking into account the real estate promoter’s method of governing, it is quite possible that this total change of direction is only apparent, and destined to be called into question on 12 February, the date of the end of the budget agreement. In any case, for the moment, numerous elements suggest that Donald Trump may have given up making the changes he promised. • (3) verify the use of US aid. Nothing new, then, apart from the fact that commercial objectives were exhaustively presented not as rivalry against the old colonial powers (France and the United Kingdom), but as a violent combat against China and Russia. On 20 December, Secretary of Defense General James Mattis addressed a public letter of resignation to President Trump . Contrary to what was reported in the Press, he was in agreement with the withdrawal of troops from Syria, but was worried about the message that this might send to the Allies of the anti-Daesh Coalition, and therefore the possible end of US leadership. Considering that he needed no public lessons, Trump immediately fired Mattis without allowing him the possibility of exercising his responsibilities until a replacement was found. However, yielding to his critics, President Trump reversed his position and admitted that the withdrawal of troops would take longer than planned. On 3 January 2019, at the opening of the 116th session of Congress, Democrat representative Eliot Engels and Republican senator Marco Rubio tabled two propositions for a law (H.R. 31 and S.1) incorporating an almost identical passage aimed at enacting sanctions blocking the rebuilding of Syria. Thereafter, Engels (the author of the Syria Accountability Act of 2003) was elected president of the Chamber’s Foreign Affairs Committee, while James Rich was elected to the equivalent Senate Committee. Rich immediately rallied to the proposition of the law against Syria. The two texts argue that it was the Syrian Arab Republic, and not the jihadists, who tortured the victims photographed in the « Caesar report », which would justify the blockage of the rebuilding of the country. The Senate text goes even further by supporting military aid to Israël, at the very moment when the Hebrew state admitted that it was carrying out an intense bombing campaign against Syria. • (3) military withdrawal from the region to the profit of an Israëlo-Arab « NATO ». However, apart from the fact that dividing the region between Arabs and Persians is even more dangerous than the current situation, the creation of an Israëlo-Arab military alliance seems unlikely – it would have the support of governments which are already collaborating in secret, certainly, but not that of popular opinion. Simultaneously, National Security Advisor John Bolton set up a terrorist internationale against Iran, including elements of the Sunni Arabs of Daesh and Persian Chiites from the People’s Mujahedin. On the same day, 10 January, Secretary of State Mike Pompeo published a declaration against Venezuela, giving the signal to Juan Guaido to self-proclaim himself as interim President. This was followed by the constitutional crisis that we see today. While the Western Press and the Venezuelans interpreted the conflict as questioning the Bolivarian government, we announced – a little early – the events that the Pentagon intended to apply to the Caribbean Basin, the same strategy that it applied earlier to the African Great Lakes, then to the Greater Middle East. After long internal discussions, the Russian Minister for Foreign Affairs adopted the same position. In particular, Moscow declared : « The deliberate and clearly well-organised creation of a double power structure and an alternative centre of decisions in Venezuela opens the door to chaos and the erosion of the Venezuelan state ». On 22 January, the Democratic Party demanded that the Chamber of Representatives adopt a law forbidding President Trump from leaving NATO. This text was co-written by Eliot Engels. Although this law had not been discussed during the mid-term election campaign, it was considered by the Democratic Party as taking priority over its engagements on Obamacare. In July 2018, Eliot Engels had co-written, with the Secretary General of NATO, Anders Fogh Rasmussen, an op-ed piece in favour of the Alliance. On 26 January, Mike Pompeo announced that neo-conservative Elliott Abrams would be his special envoy for Venezuela. However, two years ago, Abrams had been the imperialist candidate for the post of Secretary of State. His name remains associated with the worst secret US actions in Latin America during the Cold War.Neo-conservatism is a form of Trotskyism, and therefore ideologically part of the extreme left wing, rallied to the US state structure under the Reagan administration. Its partisans have never stopped swinging from left to right and vice-versa with every political alternation. They opposed the election of Donald Trump, but are now joining with him. There was indeed a re-organisation of Africom, CentCom and SouthCom which authorises all three to defend not the interests of the People of the United States, but those of transnational companies and Israël. Still associated with this policy, the neo-conservatives, or at least one of the most illustrious among them, are back. These elements tend to attest to the fact that the Republican Party and the Trump administration are radically changing their policy and returning – with the exception of the refusal to allow terrorist organisations to administer states - to the Democrat Party policies of President Barack Obama and Hillary Clinton : military imperialism in the service of transnational giants.